Mimouna is a three century old North African Jewish celebration held the day after Passover, marking the return to eating chametz (leavened foods), which are forbidden throughout the week of Passover. The celebration begins after nightfall on the last day of Passover. In many communities, non-Jewish neighbours sell chametz back to Jewish families as a beginning of the celebration. Moroccan and Algerian Jews throw open their homes to visitors, after setting out a lavish spread of traditional holiday cakes and sweetmeats. One of the holiday favorites is Mofletta. The table is also laid with various symbols of luck and fertility, with an emphasis on the number “5,” such as five pieces of gold jewelry or five beans arranged on a leaf of pastry. The repetition of the number five references the five-fingered hamsa amulet common in both Jewish and Muslim North African and Middle Eastern communities from pre-modern times. Typically all those in attendance at a Mimouna celebration are sprinkled with a mint sprig or other green dipped in milk, symbolizing good fortune and new beginnings. The tradition continued in homes across Cote Saint-Luc on Saturday night and for the first time at JPPS-Bialik, on Sunday afternoon. Our night out began after 10:00PM at the home of Anat Marciano and Michel Toledano. They welcomed my family into their home with open arms, along with our friends, Alissa and Phil Anzarut. It is customary to spend a little time visiting the host family’s home before moving on to other homes. After a beautiful spread at the Toledano’s, including Moroccan pastries, Mofletta, coucous, cheeses, fruit, smoked salmon, wine and Arak derived from figs (oy vey, it was potent) it was time to move on for the next late night visit. Thank you very much Anat and Michel. Our family traveled down the block to the warm and inviting home of Chantal Bekhor and Emmanuel Castiel. There was an endless stream of well-wishers who kept arriving. Strangers and friends alike mingled, easily offering greetings of ‘Tarbakh’, May you have good luck. Chantal Bekhor is one famous Cote Saint-Lucer after competing for Top Prize in the cookie category on Food Network Canada‘s Recipe to Riches. Bekhor, is a food sensation, who first introduced Canada to her family’s traditional recipe for the Mahbooz Date Biscuit, a typical Iraqi Jewish dessert. She was featured by the Montreal Gazette as well. The former JPPS English and math teacher is a dynamic and affable hostess along with her business partner and husband Emanuel Castiel. They opened their home to hundreds of friends during the Mimouna to some incredible pastries, cakes, chocolate bark, truffles, Iraqi delights, and more, all home made of course. While the judges on Recipe to Riches said they loved the Mahbooz treat, calling it, “Exotic, versatile, ” I can attest to the fact that her baking is even so much more. My wife is a big fan of Chantal’s food. Indeed my girls and Judy cheered Chantal on a few years back on her television debut, not just because of my wife’s common Sephardi roots, but because the Mahbooz date-filled cookie looked absolutely delicious and a treat that would be appreciated by a large number of Cote Saint-Lucers to be sure, as well as Canadians in general. Thank you Chantal and Emmanuel for such generous hospitality and for an absolutely delicious assortment of treats. My sugar level and calorie intake reached an all time, one night high. By Sunday afternoon when sugar levels stabilized it was time to continue the celebration over at JPPS-Bialik, the first time this Sephardic celebration took place at the school. The gym was decorated in Moroccan fashion, drummers and musicians greeted the guests as they entered and long tables of sweets, pastries and mofletta lined the room. The hostesses, under the direction of Judaic studies coordinator, Anat Toledano (clearly she’s a Mimouna-specialist!) all decked out in bright and shiny traditional kaftans should be very proud of bringing the festive Sephardic tunes and tastes to what has traditionally been a typical Ashkenazi school. With a large number of the families blended in both traditions, and even fully Sephardi, it was time to share this wonderful event all together. Sephardic community (CSUQ) president Henri Elbaz was invited to participate as well. Thanks to Henri’s support the event exceeded expectations and attendance. Students, parents and grandparents were entertained, fed and danced for two hours. It was an absolutely lovely event that should grow larger next year. Thank you Anat, Joanne, Judy, Carole, Beth and all the moms involved in this event. I wish you all Tarbakh, success and good luck. And now, my treadmill awaits! Judy Hagshi, Anthony Housefather (MP Mount Royal), Jeremy, Glenn, Nicole and Barry Nashen. Chanukah on the Hill. December 2017. It was a great privilege and unique experience for my family to join Prime Minister Justin Trudeau, Mount-Royal MP Anthony Housefather, Cabinet Ministers, Parliamentarians, Senators and community leaders from across Canada for Chanukah on the Hill last week for the second night of the eight-day holiday. Our Parliament was brightened by the lighting of the Chanukah Menorah. Prime Minister Justin Trudeau lights the Chanukah Menorah in Parliament as MPs Michael Levitt and Anthony Housefather look on. “Chanukah is about finding light in darkness and hope in the face of overwhelming adversity. It’s a time to honour the profound strength of the Jewish People”, Prime Minister Justin Trudeau said, on Twitter. I thank my good friend Anthony Housefather for this wonderful invitation and for his initiatives in ensuring the centrality of Canadian Jews within the deliberations in the Parliament of Canada. Green Party Leader Elizabeth May lights the Chanukah Menorah. MPs Michael Levitt and Anthony Housefather look on. Chabad Cote Saint-Luc held its annual celebration of Simchat Beit HaShoeivah last night in Trudeau Park. Many hundreds, perhaps a thousand people or more were in attendance to hear internationally renowned chanteur Avraham David. There were games and food for the children, videos and lots of live performances. Rabbi David Cohen invited the Mayor and Council along with the Member of Parliament up on stage and thanked us all for our work in building an extraordinary community and in welcoming Chabad to put on their events. Anthony Housefather, an eloquent orator in several languages, said that Canada is known worldwide for its multicultural policies of encouraging and supporting cultural communities, such as ours in CSL. Rabbi Cohen passed the mic to each councillor to bring greetings for a Happy New Year to which I added by good wishes in Yiddish and Hebrew. Chag Sameach one and all. A gut yontif un a ziseh yor! Chabad Cote Saint-Luc a tenu sa célébration annuelle de Simchat Beit HaShoeivah hier soir dans le parc Trudeau. Plusieurs centaines, peut-être mille personnes ou plus étaient présents pour entendre chanteur international, Avraham David. Il y avait des jeux et de la nourriture pour les enfants, des vidéos et beaucoup de spectacles. Les conseillers Allan J. Levine, Sidney Benizri, Steven Erdelyi, Glenn J. Nashen et Ruth Kovac, ainsi que le maire Mitchell Brownstein et Anthony Housefather, député était la pour les célébrations. Le rabbin David Cohen a invité le maire et le conseil avec le député sur la scène et nous a remercié tous pour notre travail dans la communauté et en accueillant Chabad pour faire valoir leurs événements. Le maire Mitchell Brownstein a souligné que CSL est une communauté unique et spéciale dans laquelle nous nous efforçons d’être tolérants, et respectueux, les uns aux autres. «Les gens se déplacent ici, non seulement dans d’autres régions de Montréal et de Laval, mais de la France et d’autres pays pour vivre en paix et en sécurité et pour être à l’aise dans la vie juive, sans peur». Anthony Housefather, un orateur éloquent dans plusieurs langues, a déclaré que le Canada est connu dans le monde entier pour ses politiques multiculturelles visant à encourager et à soutenir les communautés culturelles, comme la nôtre à CSL. Le rabbin Cohen a passé le micro à chaque conseiller pour faire une salutation pour une bonne et heureuse année à laquelle j’ai ajouté par ses vœux en yiddish et en hébreu. This past week my family and I joined Mayor Mitchell Brownstein, members of City Council and MP Anthony Housefather in Rabbi Mendel and Mrs. Sarah Raskin’s Chabad Cote Saint-Luc Sukkah for a lovely dinner in celebration of the holiday of Sukkot. Rabbi Raskin welcomed us and expressed his wish that we would be returned to Council on November 5, “to continue our important work for the community”. He invited each of us to say a few words to the overflow crowd. The Mayor spoke about happiness and enjoying every moment of life, referring to the harmony that exists in Cote Saint-Luc among all groups, be it linguistic, religious or any other. He praised the work of the Rabbi and Mrs. Raskin and congratulated him on his 30+ years of building community in Cote Saint-Luc. When my turn came I spoke about renewal. Next week we begin reading the Torah once again from the very beginning and so too I pledged my own personal renewal: my commitment to serving the residents of Cote Saint-Luc, looking out for their safety and security, ensuring we remain the safest place to live on the Island of Montreal. CSL is a big Mishpacha, a family, where residents help one another through volunteerism to strengthen our community one family at a time. No matter the language, nor one’s religious affiliation, we are a close community, highly respectful of one another. This experience has made CSL a magnet for families emigrating from France, Russia, Argentina and other places where their religious beliefs and background could not be publicly displayed nor celebrated, as evidenced by the number of recent arrivals to Canada sharing a meal with us in the Sukkah. After an elaborate five course meal for over 113 invited guests, the Rabbi lead us onto Cavendish Boulevard to dance in the street. 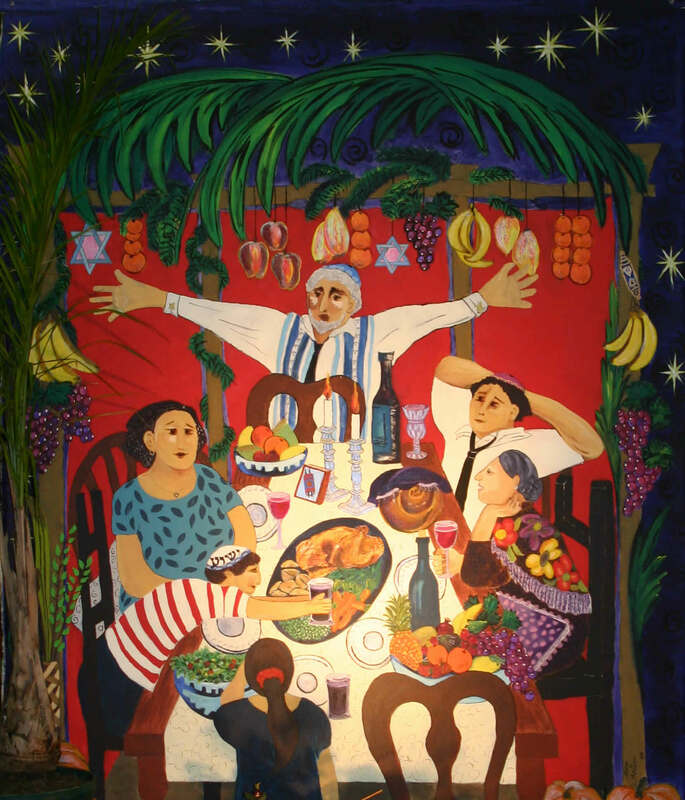 Sukkot is also called “The Time of Our Joy” (Zman Simchateinu) – a special joy pervades the festival. Celebrations and festivities fill the synagogues and streets with song, music, and dance until the wee hours of the morning. Earlier that day I was overwhelmed by the welcome that the Mayor and I, together with former MNA for D’Arcy McGee and Minister of Revenue, Lawrence Bergman, received at Congregation or Hahayim. And the very next day we were welcomed to Beth Chabad Hechal Menachem for their Sukkot services for both Sephardim and Ashkenazim, beautifully united in the same synagogue. Thanks to Rabbi Mendel and Mrs. Sarah Raskin for bringing overwhelming joy and deep compassion to the people of Cote Saint-Luc and beyond. For forty years, as our ancestors traversed the Sinai Desert prior to their entry into the Holy Land, miraculous “clouds of glory” surrounded and hovered over them, shielding them from the dangers and discomforts of the desert. Ever since, we remember G‑d’s kindness and reaffirm our trust in His providence by dwelling in a sukkah – a hut of temporary construction with a roof covering of branches – for the duration of the autumn Sukkot festival. For seven days and nights, we eat all our meals in the sukkah – reciting a special blessing – and otherwise regard it as our home. La semaine dernière, ma famille et moi ont rejoint le maire Mitchell Brownstein, les membres du conseil municipal et le député Anthony Housefather chez le Rabbin Mendel et Mme Sarah Raskin de Chabad CSL dans leur Sukkah pour un dîner très agréable dans la célébration de la fête de Souccot. Le Rabbin Raskin nous a accueillis et a exprimé son souhait que nous serions retournés au Conseil le 5 novembre, “pour suivez notre travail important pour la communauté”. Il a invité chacun de nous à dire quelques mots aux invités. Le maire a parlé de bonheur et de jouir de tous les moments de la vie, en se référant à l’harmonie qui existe dans à Côte-Saint-Luc parmi tous les groupes, qu’il soit linguistique, religieux ou autre. Il a salué le travail du Rabbin et Mme Raskin à amener les jeunes familles et l’a félicité pour ses 30 ans de travaille important à CSL. À mon tour, j’ai parlé de la renouvellement. La semaine prochaine, nous recommençons à lire la Torah une fois encore dès le début. Alors, j’ai promis mon propre renouvellement personnel: mon engagement à servir les résidents de Cote Saint-Luc, en respectant leur sécurité et leur sécurité, en nous assurant que nous restons l’endroit le plus sûr pour vivre sur l’île de Montréal. CSL est une grande Mishpacha, une famille, où les résidents s’entraident par le biais du bénévolat afin de renforcer notre communauté, une famille à la fois. Peu importe la langue, ni l’appartenance religieuse, nous sommes une communauté solide, très respectueuse l’une de l’autre. Cette expérience a fait de CSL un atout pour les familles émigrant de la France, de la Russie, de l’Argentine et d’autres lieux où leurs croyances et antécédents religieux ne pouvaient pas être publiquement exposés ni célébrés, comme en témoigne le nombre d’arrivées récentes au Canada partageant un repas avec nous dans le Succah. Plus tôt ce jour-là, j’ai été si heureux par l’accueil que le maire et moi-même, ainsi que l’ancien député d’Arcy McGee et le ministre du Revenu, Lawrence Bergman, ont été reçus lors de la Congrégation Or Hahayim. Et le lendemain, nous avons été accueillis à Beth Chabad Hechal Menachem pour leurs services Sukkot à la fois pour Sephardim et Ashkenazim, magnifiquement unis dans la même synagogue. Depuis quarante ans, comme nos ancêtres ont traversé le désert du Sinaï, avant leur entrée dans la Terre sainte, miraculeuse “nuages de gloire” entouré et planait sur eux, les protégeant contre les dangers et inconvénients du désert. Depuis, nous nous souvenons la gentillesse de Dieu et de réaffirmer notre confiance dans sa providence par habitation dans une soukkah – une cabane de construction temporaire avec une couverture de toiture de branches – pour la durée de la fête de Souccot. Pendant sept jours et nuits, nous mangeons tous nos repas dans la Souccah – réciter une bénédiction spéciale – et par ailleurs le considérer comme notre maison. Après un diner extraordinaire, le Rabbin nous a inviter à danser sur sur le boulevard Cavendish. Souccot est appelé aussi “Le temps de notre joie” (Zman simchateinu) – une joie particulière imprègne le festival. Célébrations et fêtes de remplir les synagogues et les rues avec des chants, de musique et de danse jusqu’aux petites heures du matin. Merci à Rabbi Mendel et Mme Sarah Raskin pour apporter la joie immense et une profonde compassion pour le peuple de Côte Saint-Luc. Jack Budovitch was a proud Cote Saint-Lucer, a volunteer and leader and active in the Royal Canadian Legion Branch 97. Jack would often be seen selling poppies to help support charities throughout the city. Jack was a founder of the Cote Saint-Luc Senior Men’s Club and served as its president. He was extremely devoted to the success of this organization and was instrumental in encouraging the city to eventually move the group from its old location in the CSL Shopping Centre to its current place in the Aquatic and Community Centre. Jack passed away on September 1, 2017 at the age of 95. “Our deepest sympathy to the family from your comerades at Branch 97 Frederich Kisch RCL. Jack was our number one poppy person. His adoring smile won the hearts of every customer at the CSL IGA. Always a pal to everyone with boundless emery to raise funds for every good cause. His adoring fans will greatly miss this charitable celebrity,” said Councillor Allan J. Levine. Jack was such a delightful person. He always had a smile and a positive comment. His interest and involvement in the civic life of Cote Saint-Luc was substantial. He was well respected and appreciated by the members of City Council. He will be remembered and missed.